This morning saw Electronic Arts kick off its Gamescom with a game-studded conference. Featuring new ways to play Star Wars Battlefront, first-look footage of the new Mirror's Edge and one of the most beautiful-looking 2D platformers we've ever seen. The show kicked off though with the new Need for Speed with EA promising to bring all twenty years of the franchise's heritage together to create the definitive NFS game in November. Taking five urban 'automotive icons' and five different ways to play - speed, style, build, crew or outlaw - you can either get your drift on with Ken Block or go rogue and bother the rozzers with Morohoshi San. The big thing coming out of first Quantum Break and now Need for Speed though is that live action game content is back in a big way. NFS is compositing live action video with the Frostbite graphics engine to give the game a bit of a Fast and the Furious taste. Mirror's Edge Catalyst is one of the sequels we're seriously excited to play. Taking the guns out of first person has the main protagonist, Faith, free-running around the dystopic future cityscape slide-kicking bothersome security folk and stealing sensitive documents. We're glad Faith hasn't turned into the sort of blood-thirsty monster Lara seems to have become/started out as in Rise of the Tomb Raider. The game looks a lot darker now, but we're hoping the disorientating first-person running has been smoothed out without losing its edge. We'll have to wait til February next year to find out. One of the most beautiful things EA had to show though was the gorgeous-looking Unravel. The cross-platform, sideways scrolling, physics-based platformer is heart-breakingly cute and could become a little darling of the games industry. Unravel is from another of EA's Swedish connections, Coldwood, and features Yarny, a little (woollen?) character who leaves a trail of its own thread across each level. Check out the gameplay footage below. What we all really turned up to see though was more Star Wars goodness. Not necessarily the Old Republic MMO, but EA is doing some more Bioware-scripted episodes for the game. No, what we want is more Star Wars Battlefront and the big news was a new game mode: Fighter Squadron. This twenty player aerial combat mode pits the Rebels against the Empire in the most iconic of craft from the Star Wars universe. And yes, you get to fly the Millenium Falcon. And if we're not mistaken potentially Boba Fett's Slave 1 too. 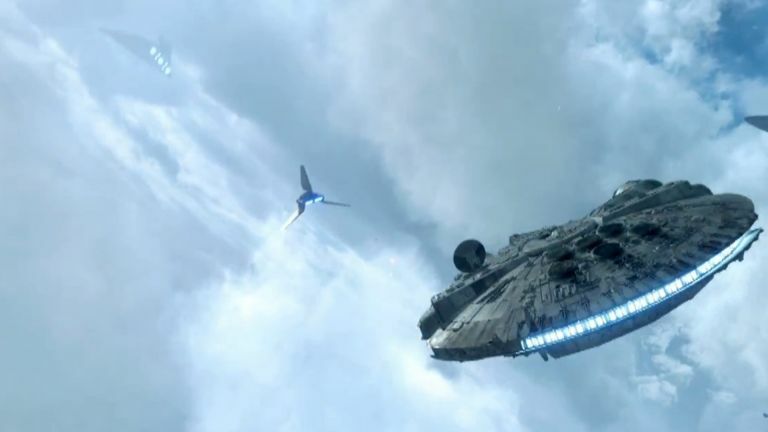 DICE is looking to create proper Star Wars furballs in the skies over Battlefront's planets, adding in an extra twenty AI-controlled craft into each of the combat missions too. We've been hankering for some X-Wing vs. Tie Fighter action for years, lets hope Star Wars Battlefront can live up to those classic old Lucasarts games. What did Microsoft have to talk about?